I apologize for the super lateness in this post, but here it is. As part of ING Miami Marathon weekend, they have a 5k for ING runners to warm up and everyone else to run/walk the short 3.1 mile distance. 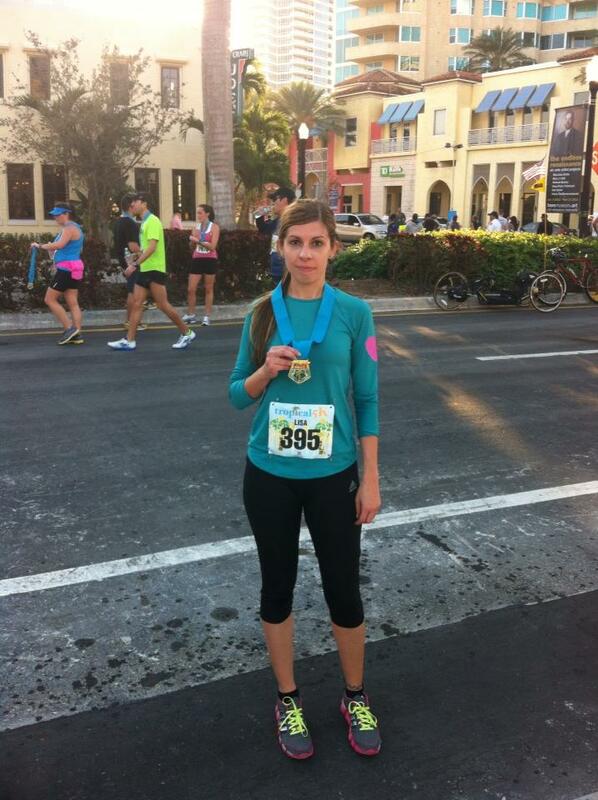 Also you get a medal at the finish line, which to me was a big incentive since I have yet to get a medal. Then again, I have also yet to race a half or full marathon either, but I am currently training for one. Friday night I laid out all my race gear and checked weather.com, it showed a cool high 50’s morning for Saturday. 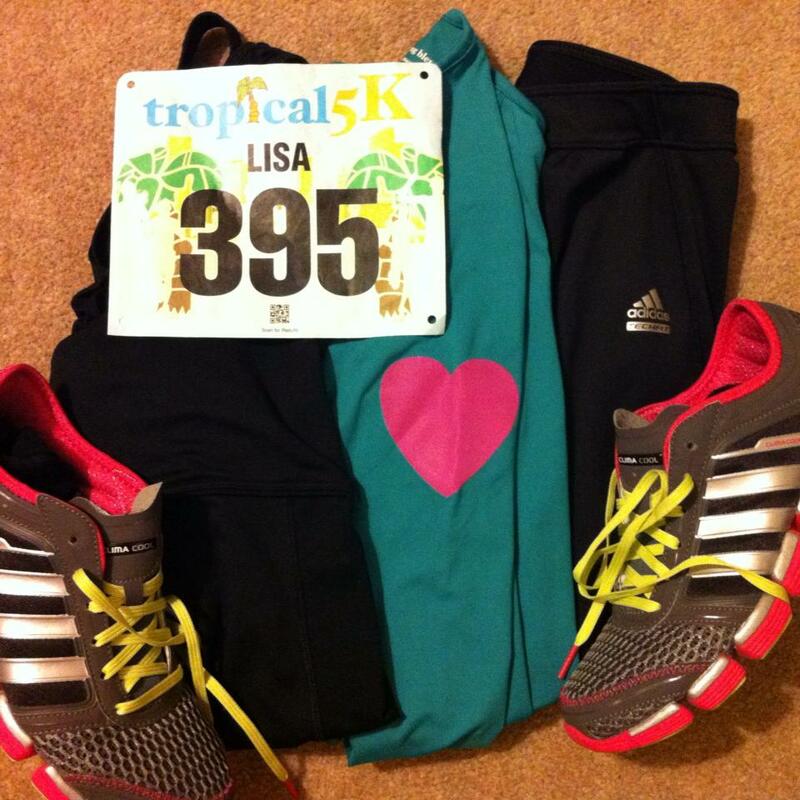 That meant I would finally get to wear my long sleeve RunningSkirts top with a heart on the sleeve. If you don’t know already, I love all heart printed things, so I was overjoyed at the cool weather. Saturday morning I woke up at 5am, had a quick bowl of Kashi cereal, and was out the door by 5:30am, heading to the beach. The moon was full and peering between the buildings of downtown, made me think this was a sign of a great race day. 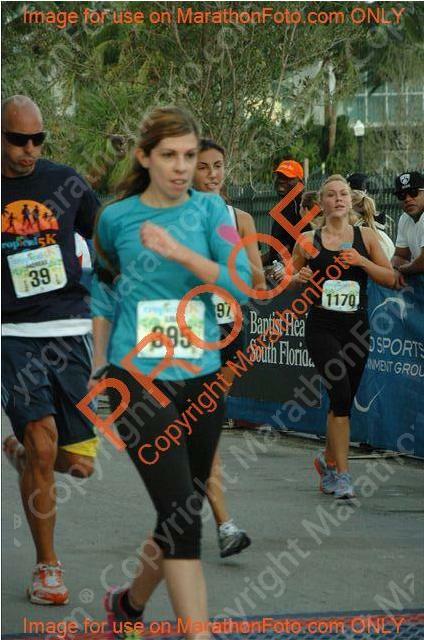 The start was at the Children’s Museum and the finish line was at Joe’s Stone Crabs in Miami Beach, it was my first point to point race. I met up with my friend there, about 10 minutes before the race began and we squeezed our way into the crowd, about 100 feet from the starting line. Excitement began to build as Bart Yasso spoke to the crowd just before the gun went off. Suddenly we were off, dodging and weaving around children and walkers, finally about 1.5 mile out we had a less of a crowd and could relax a little more into our pace. My friend’s calves began to cramp a bit since she had did some spinning the night before, so we slowed down slightly at the water stop. Then was the slight incline of the bridge, I never train on hills, which I know, I know I really should start, that slowed me down considerably. There weren’t too many spectators cheering us on till we got closer to the finish line, I still laugh thinking about the very Cuban ‘Dale-eee’ sign someone was holding up at the end. Sprinted the last bit and finished with a new PR of 26:11! 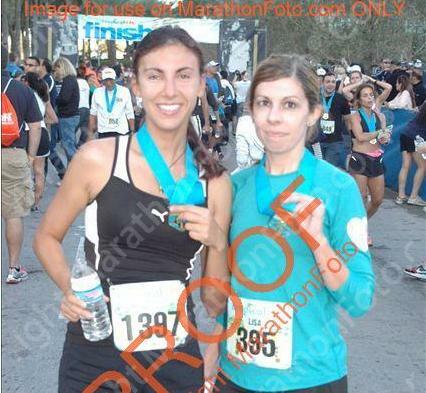 With my race buddy, Ana, showing off our medals. I swear I’m happy! Right after, can you see sweat? We then walked over to Nikki Beach and enjoyed a banana, bagel and some oatmeal raisin cookies before walking out to the sand and looking at the ocean for a few minutes. It was a great ending to a race, how many people really get to see that after the finish line? 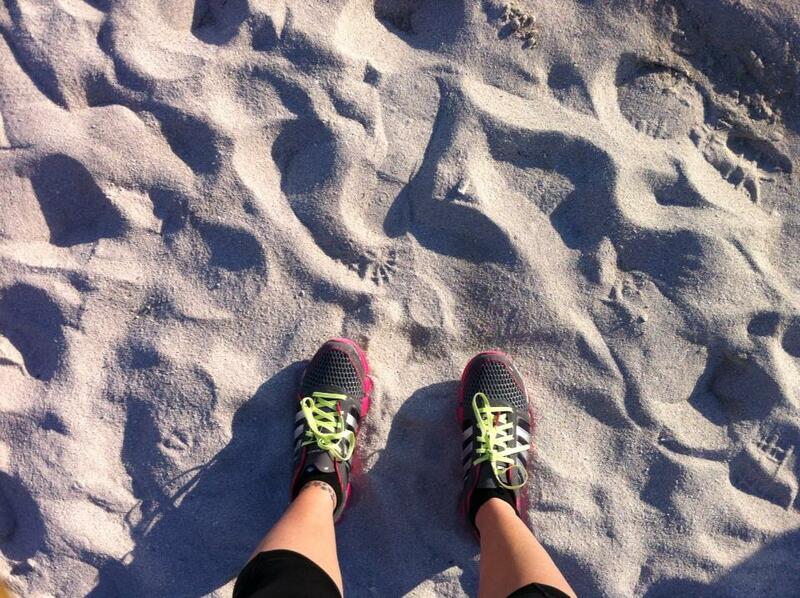 Had an amazing morning, running on a great course with a friend. Might even do it again next year as a warm up for the ING half marathon. I’ve already signed up, what about you? Have you ever ran a race that ended in a beautiful location? 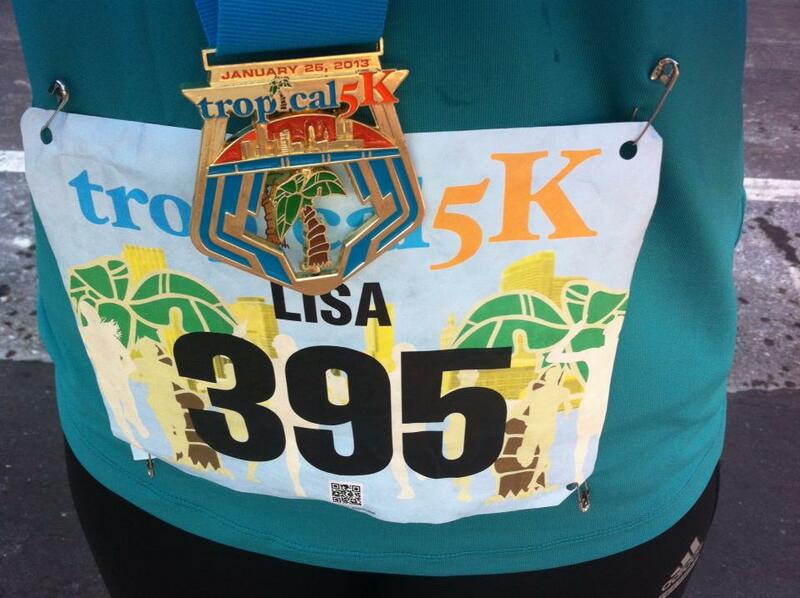 Anyone signed up for ING 2014 Half/Full Marathon yet?